On this page Robert shares the books that have been important to him in his recovery, on his Spiritual, healing path - and makes recommendations about authors whose work he respects and has found valuable. There are now so many books out there dealing with codependence, inner child healing, Spiritual enlightenment, Metaphysical Truth, etc. - that it is both good news and bad news (as everything in life is, of course.) The good news is that there are so many books out there about healing and Spirituality that it is sure evidence of the Healing Transformational Movement that is taking place on the planet. The bad news is that there are so many books out there that it must be very confusing for anyone going to buy a book. One of the things I learned along my path was to pay attention to what got my attention. The Universe is fully capable of sending me messages at any place and any time. My job is to be as conscious as I can be in the moment so that I can allow the Spirit to guide me. One of the things I did in the early years of my process was to go into a book store and page through the various books - when I read something that caused my gut to react I figured that my inner child, my Spirit, was telling me I needed that book. (I would usually buy it with more than a little apprehension - wondering what was going to be revealed next.) So, even though you cannot pick these books up and leaf through them you can go to the description page and read about them. If something grabs your attention, maybe it is the Universe sending a message. Announcing the publication of my newest book - or at least the Kindle e-book version (hopefully the hard copy by the end of the month - and will add that info here when available) Romantic Relationships ~ The Greatest Arena for Spiritual & Emotional Growth Codependent Dysfunctional Relationship Dynamics & Healthy Relationship Behavior. There are free Kindle Apps for your computer (Windows or Mac), for Tablets iPad or Android, for Smartphones iPhone & iPod Touch, Android, Windows Phone 7, or Blackberry. For special offers on signed copies of the book and tape set directly from Joy to You & Me go to the ordering information page. Clicking on the book cover or the link in the book title below will take you to the Amazon.com page with information about that book. I have been associated with Amazon.com for going on 5 years now and have found them an honorable and admirable partner. They offer discounts on most of the books listed below. They also offer gift-wrapping, let people add gift messages, and will ship anywhere in the world. A search engine for their entire catalog is available at the bottom of the page - as is a new feature with recommendations for books. In Illusions: The Adventures of a Reluctant Messiah, Richard Bach met Donald Shimoda, a fellow pilot with the keys to the universe who barnstormed the Midwest in a Travel Air biplane. 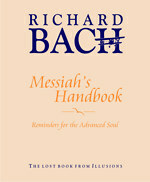 Part of Shimoda's secret was a small book, bound in what looked like suede: Messiah's Handbook, Reminders for the Advanced Soul. "Open it," he said, "and whatever you need to know is there." Lost for decades and rediscovered, here it is in print at last—reminders for those who have outgrown cynicism and doubt. "Where do you learn all this stuff, Don? You know so much, or maybe I just think you do. No. You do know a lot. Is it all practice? Don't you get any formal training to be a Master?" "They give you a book to read." Melody Beattie's work has changed millions of lives. In my opinion, Codependent No More is still the best basic book for anyone new to the concept of Codependence. Codependent No More : How to Stop Controlling Others and Start Caring for Yourself ~ Beyond Codependency was her second best selling book. You can now get them both in one book. It Will Never Happen To Me by Claudia Black ~ One of the people who defined Adult Child Syndrome, Claudia had a great personal impact on my recovery. I attended several of her workshops and saw her at an ACA convention. Her presence and validation in our interactions was very powerful for me. I will always be grateful to her for being herself. John Bradshaw's PBS series on the family was a true breakthrough in cultural consciousness. Healing the Child Within was a very important part of my inner child journey. I have great respect for Charles Whitfield's work. Though not a book specifically for inner child work Julia Cameron's book is great for helping you get in touch with feelings because the doorway to our creativity is through the child within. Do her writing exercise every day for a couple of weeks and you will get in touch with some of the feelings of your inner child. Sometimes called the mother of the ACoA movement Janet Woititz broke new ground in the understanding of the Adult Child of an alcoholic by listing the characteristics that ACoAs share. Other books by Janet Woititz: Healthy Parenting: An Empowering Guide for Adult Children, The Intimacy Struggle Choicemaking : For Co-Dependents, Adult Children and Spirituality Seekers by Sharon Wegschieder Cruse was another of the real pioneering works in the field. I spent many years healing my inner child and my feminine without even considering that I needed to heal my masculine. This book was an important part of my path. Iron John : A book about men ~ Robert Bly An important and empowering book for women. Fire in the Belly : On Being a Man ~ Sam Keen One of the really important groundbreaking books that served as a wake up call for a lot of women. The Dance of Quantum Physics ~ Both "The Tao" & "Wu Li" were mind expanding for me. The Rune Stones are another tool that has been very helpful to me. 2-1-03 - Below is a search engine for Amazon.com and Amazon.uk (United Kingdom) - as well as a link to Amazon.ca (Canada). On the left is a new feature from Amazon. It lists books that match the buying patterns of people who have bought books from Amazon - either through links here on my site, or through starting out on my site. Since, I do get a small percentage of any sales generated from my site, I thought I would give this a try. Every little bit helps. Hopefully, it will be helpful to you. My book is not available through any of the sources below - but many others are. On the book store page of my original web site I have links to UK version of Amazon for all of you in the United Kingdom. It is too much trouble and would take too much time to add all those Amazon.co.uk links here - so you can go to the original book store page or click on the logo or use the search box below for Amazon.com.